Confession – I’ve been thinking of snowmen a lot lately. I’ve shared a few crafts on the blog already and this past weekend I shared an awesome roundup of snowman themed crafts and ideas. It’s been snowman overload to say the least. So to go with the theme of my heart, I decided to whip up a snowman snack for my two favorite men. They of course enjoyed it to the last drop and I loved how simple it was. Not only is this a yummy snack – but it’s also great for a party or any celebration you may throw this winter. 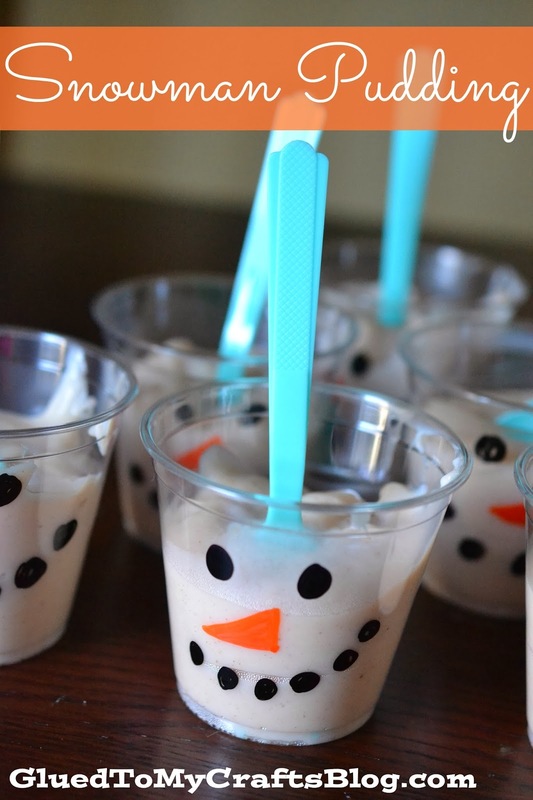 With just a few simple supplies and ingredients – you can have these snowman pudding cups whipped up in no time! So let’s talk about the snowman cups first – shall we? For these you will need clear, plastic cups and sharpies. A black and orange sharpie is ideal but you could probably use any color you have on hand. Using your sharpie – paint on the face. Dots for the eyes and mouth. And an orange carrot for the nose. Now on to the pudding! 1. In a medium sized saucepan – add your sugar, cornstarch and salt. Heat over medium heat. Gradually whisk in your milk. Cook for 5 minutes, stirring constantly, until thickened and bubbly. 3. Once ready to serve – pour into your plastic cups. Depending on the size of your cups, you may get 4-6 servings. Easy, right? For some added flavor you can stir in some cinnamon, banana chunks or maple syrup. Enjoy!